We’re a week into our new resistance band exercise regimen, and someone who shall remain nameless came up with the idea that we should start logging our body measurements.The idea was pretty simple: The scale is not a reliable source of information about our weight loss. But physiological changes will be taking place whether or not the scale moves, right? So why not start tracking that info? It seemed like a valid idea, and it probably is, but taken as a whole the first set of measurements didn’t do anything but make me depressed. Since the baseline is being set now, I have no idea what kind of progress has been made over the last 4 months. Mainly what I have demonstrated to myself is that I have got so far to go that it isn’t even funny. Take my waistline, for example. I clocked in at 47 inches. 47!! 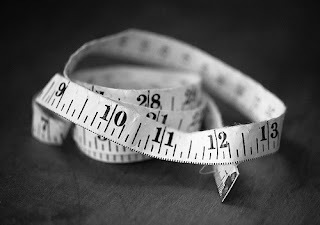 I have been shopping for 48-inch waistline clothing in FatLandia for as long as I can remember, so apparently I have managed only a single inch of loss in 4 months. Well, yes, I can now get into 46-inch pants, but only because my beach-ball belly has deflated a bit, and slid further down my abdomen. My chest was close to what it used to be – 47 1/2 inches. Back when I was attending a gym regularly I used to clock in at a 48-inch chest. The difference is that then I had pecs – today I have breasts. They are not the size that would excite the typical teenage boy, but I really could get away with wearing a bra. After some of my more strenuous workouts, I actually kind of wish I had put one on before I left the house. But the really depressing numbers were my arms: a measly 12.5 and 13 inches. Back in the day, I had 17-inch biceps. Mind you, this was back when I was doing things like 235-pound bench presses as part of my normal workout routine. Were I to try to bench 235 today I would likely drop the barbell and cut my own head off. I have had big plans for years for a 3/4 sleeve tattooed on my left arm, centered around a scene on a beach. I can’t fit a beach scene on this arm. Maybe a single palm tree. As long as it is a skinny palm tree, anyway. Now, yes, a certain amount of this is nothing more than “The older I get, the better I was.” But mainly it is disgust at how far I have let myself slip over the years. I don’t think of myself as terribly vain, at least not about my appearance. So it was really surprising to me how strong of an emotional reaction I had to these numbers. It was as if every negative thing I have ever said about the way I look was being documented in black and white – the opinions of those who have tried to encourage me over the years being proved wrong once and for all. See? I have proof. A month, or 6 months, or maybe a year from now, these numbers will demonstrate something about how far I have come at that point. For now, they’ve just bummed me out.